VPopp Inc. offers licensed expertise for insurance and legal matters, including expert witness testimony. Investigations include consumer products, high pressure and mechanical devices, residential and commercial building matters. Vic Popp's knowledge of design, materials, testing equipment, and standards will help you determine the best way to proceed---especially in unusual cases. Many successful settlements and verdicts. 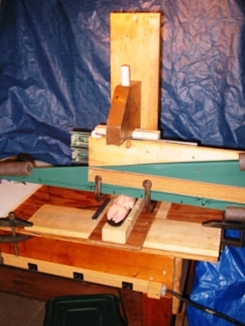 "Simple" fixture to demonstrate product sharpness against "simulant flesh" (pigs' feet). This simulation of accident conditions quantified the effect of insufficient deburring. Our report (52 pages) led to a favorable settlement. Top left: Fire from thermosat; top right: excessive pressure due to icing; bottom left: shower pan leak due to poor workmanship; bottom right: ailed water booster pump in sprinkler system. .
A little gas explosion investigation....fortunatelym no one was hurt and it was just prior to occupancy. Roof Failure Case: Expert witness in roofing failure case. Expert witnessing: soil tests were ordered to confirm landfill conditions. Settlement caused racked window casings and step cracks in masonry (left photo). Another wall is tilted out, and was "covered up" with parging (right). © Copyright 2004, VPopp Inc. All Rights Reserved. Reproduction in whole or part without explicit permission is prohibited.